You are here: Home / Topics / Build More Power / Best Hitters Baseball Barrel Path – Do We Have It All Wrong? 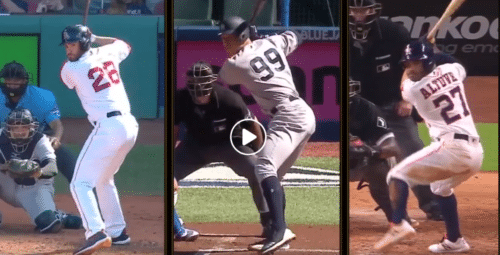 Best Hitters Baseball Barrel Path – Do We Have It All Wrong? Khris Davis is 5'10" with a ton of power. How does he generate it?Sean Casey shows how his back elbow and bat path help him get it done. …And I’m sorry. But I will say this, most are being misled on the best hitters baseball bat path. The principle you’ll discover shortly also apply to fast-pitch and slow-pitch softball. …according to Diamond Demo video above: “Breaking down Khris Davis”. In January of 2018, I was working with one of my hitters, who has been working with me since he was 7 years old. He’s 15 years old now, in the 8th grade, and consistently hits with a low to mid 80’s Ball Exit Speed off the Backspin Tee, using a wood bat. This got me thinking, so I jumped on Twitter to look at the best hitters baseball bat paths. Specifically, I was looking for hitters, like the ones on the split screen images above, crushing 94-mph+ on the inner third of the plate, and guess what I saw?? The ones who demonstrated the Catapult Loading System principles well (namely ‘showing numbers’), still did so at stride landing on inside heat! Did you catch that?! ‘Showing numbers’ was irrelevant to crushing the inside pitch. CLICK HERE for a post I did debunking that. So what were they doing different on the inner third? It had to do with what we call hitting a different “catcher’s glove”. I won’t go into the details of that here because I already did at the following post titled: “Accelerate Barrel Rearward Like Mike Trout”. The best hitters baseball barrel path isn’t about a one-size-fits-all approach to all pitches and timing. Signs that pitcher’s are smartening up to countering this seemingly effective low in the zone barrel approach? Pitchers are now using this, which Perry Husband calls Effective Velocity (EV), to exploit hitters with longer barrel paths. How To Optimize Directional Force Using The “Pounding Nail” Drill. https://hittingperformancelab.com/wp-content/uploads/2018/09/martinez-judge-altuve-e1537893820763.png 255 500 Joey Myers https://hittingperformancelab.com/wp-content/uploads/2018/05/hitting-performance-labs_c90c0362088ef1d3d528f3078f4f8ac1.png Joey Myers2018-09-27 04:22:102018-09-27 23:30:46Best Hitters Baseball Barrel Path - Do We Have It All Wrong? Baseball Swing Path: How-To Increase A Hitter's Strikeouts? I’d like to see the Diamond Demo guys use the chairs and tape props to explain how to hit a pitch on the outside corner at the knees. Keep that bat flat along those tape lines and see how that works out. How do you get the bat “long through the zone” on a low pitch? Swing on your knees? Look at the Trout and Davis clips from chest view. They do not flatten out their bat path – it is (virtually) a circle. Tilt the circle, hit the pitch on the outside corner at the knees. When keeping the hands in tight to your body, like Joey teaches us, the ballerina or ice skater goes faster. The tighter the hands are in to the torso, the better the swing, as opposed to “push disconnection”, or hands/knob to the ball. You would have to somehow push your hands during the swing to get a flat bat bath like these guys are saying. Just my opinion; I could be wrong. They are right about the catapult loading system, though. Great post, Joey! Thanks. Great information. The clips show it all. Thank you for your hard work. It’s hard to get coach to change. My sons JV coach told a player to hit ground balls in cage. Thank you James. I know that’s frustrating. The only time telling a hitter to hit ground-balls, is if they’re hitting non-productive fly-balls. Keep your chin up my friend. It seems all very simple, or maybe it doesn’t. A hitter has to have a different swing for different pitch heights. Who would swing at a high pitch like it is a low one? Why would someone teach a hitter to swing the same way at all pitches? Isn’t it obvious? Maybe it isn’t to the Orioles Chris Davis. Great analysis by Perry Husband but it’s not all percentages. Chris Davis’ hitch and early arm bar are not conducive to matching his swing to all pitch planes, particularly high fastballs. You are not advocating a different hand path to match varying pitch planes, are you? (That clip of Andrew McCutcheon I sent you in which his hands go downward, diagonally across the front of his rear shoulder) Just the barrel path, correct? This post isn’t about adjusting to pitch height. In that regard, the barrel angle should match shoulder angle. Pitch is low, then shoulder angle and barrel are steep. If pitch is high, then shoulder and barrel angle will be more flat. This post addresses differing pitch depths – inner, middle, and outer third of the plate. Inner 1/3 = hitting “belly button” catcher’s glove. Middle 1/3 = hitting “back foot” catcher’s glove. Outer 1/3 = hitting “real” catcher’s glove. Rearward barrel acceleration depends on pitch depth, and MUST not be taught as a one-size-fits-all barrel path. Interestingly enough, in regards to which “catcher’s glove” to hit, the approach on higher pitches seems to be the same as inner 1/3. And the approach on lower pitches seems to be the same as outer 1/3. Nothing… I guess I’m wrong!!! The MLB analysts have it all wrong on Davis. Davis has said a several occasions that he clears his head and thinks of nothing while at the plate. Davis just reacts to the pitch. He is not trying to hit the ball to any particular place. He is just trying to hit the ball hard. That is exactly what a players MUST do to succeed. Unconscious competence. Oh, I misunderstood. Sorry, I though he was saying that Davis told him that personally. That’s a given. The Stanford neuroscientist David Eagleman calls it hypofrontality. Yogi Berra said that, “You can’t think and hit at the same time.”. Same thing, different language. We tune out the upper regions of our brains and tune into our lower regions, which operate at a level below our conscious awareness. Our cerebellum has a library of all learned movements like a swing. The cerebellum is also involved with proprioception. And we are not aware that our cerebellum is working when it is. Talking about unconscious competence, check out Alex Honnold’s climb up El Capitan in the Oscar winning documentary, FREE SOLO. Thanks Joe, I’ll have to check it out!